Now living in Alpena, Michigan, where Shane serves as Branch President and continues making a living as a Physician Assistant for a group of orthopedic surgeons. With #4 child on the way (they just found out this month that it's a boy! ), Cami keeps mighty busy as a full-time mother to her children AND the small LDS Branch where they live. They've started raising chickens and grow a beautiful garden every summer. The area is absolutely gorgeous, right on the shore of Lake Huron. But it's a trek to get there! We got to spend the July 4th holiday with them, as we traveled the 8 hours from Cincinnati to their place. 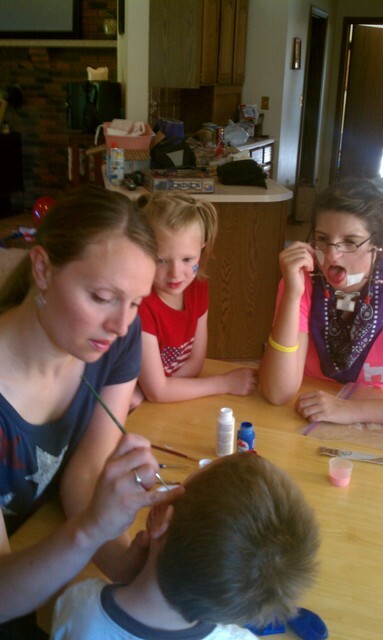 Cami, painting Cade's face for July 4th, with Brinly and Katie looking on. Unfortunately, Adelle is missing in this shot! Katie has the lower jaw distractors on in this photo, with Ben-Gay patches to help control the pain.